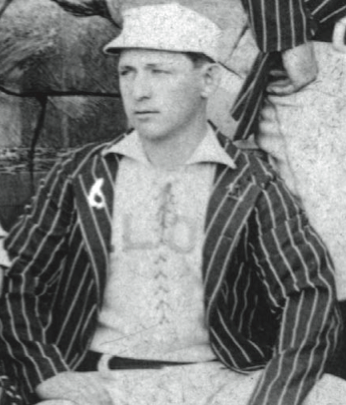 Sam Thompson may have been the best hitter in baseball in 1887. But at what might have been the season’s climactic moment, a single swing of his bat nearly turned the powerful Indianan known as Big Sam from hero to goat. The setting was the 10th game of a 15-game World Championship Series between Thompson’s National League champion Detroits (widely known as the Wolverines) and Chris Von der Ahe’s American Association champion St. Louis Browns. The Browns were reigning world champions, having beaten the Chicago White Stockings in a dramatic postseason series in 1886. They had compiled a .704 winning percentage against Association teams in 1887. But the Wolverines were also formidable, even without their other star slugger, Dan Brouthers, who was injured. Detroit’s .637 winning percentage had been good for a 3½-game advantage over second-place Philadelphia. Detroit held a commanding seven games to two lead in the scheduled 15-game World Championship Series and needed just one more victory as the teams prepared for the 10th game on Thursday, October 20, in Washington. But a steady rain postponed the game, and created a dilemma. Since the next game in the series was already on the schedule for the following day in Baltimore, the teams agreed to play two games on Friday, the first in Washington at 10:30 a.m. and a second 40 miles away in Baltimore that afternoon. Umpire John Gaffney called the game to start at 10:30. Despite the early start, between 3,000 and 4,000 spectators were in attendance. The first batter was Hardy Richardson, second baseman of the Detroits, and he put the fourth pitch from Bob Caruthers over the left-field fence for a home run. It was a great start for Detroit, but even so, at the end of the first inning the score stood 2–2. That remained the situation as Detroit came to bat in the top of the third inning. Richardson singled to left, and Charlie Ganzel followed with a line single to right. Jack Rowe then dropped one between first baseman Charlie Comiskey and right fielder Dave Foutz that loaded the bases with no one out. The Wolverines appeared poised to take command of the game that would bring the team the world championship, even more so since the next batter was Sam Thompson. Big Sam had 203 hits and 166 runs batted in during the 1877 season. Except for the rule put in place that season counting walks as hits (in fact, Total Baseball, eighth edition listed Thompson with 235 hits), Thompson’s .372 batting average would have been good for the league leadership in that category as well. So remarkable were Thompson’s accomplishments that in 1974 he would be voted into the Hall of Fame. Detroit fans in Washington that day could not have hoped for a better hitter to come to the plate in that spot. Thompson picked out a Caruthers pitch and hit a crisp line drive. But the ball flew right to Browns shortstop Bill Gleason, who caught it to retire Thompson and fired to third baseman Arlie Latham. He touched third base for the second out, retiring Richardson, who was headed down the third-base line toward home plate with what he presumed would be the go-ahead run. Latham then threw to second baseman Yank Robinson, who touched that base before Ganzel could return to it. In a matter of a couple of seconds, a rally that could have led to a world championship turned into a 6-5-4 triple play, the first in World Series history. It was the last rally for Detroit that morning. The Wolverines scored single runs in the fifth and ninth innings, but lost 11–4. 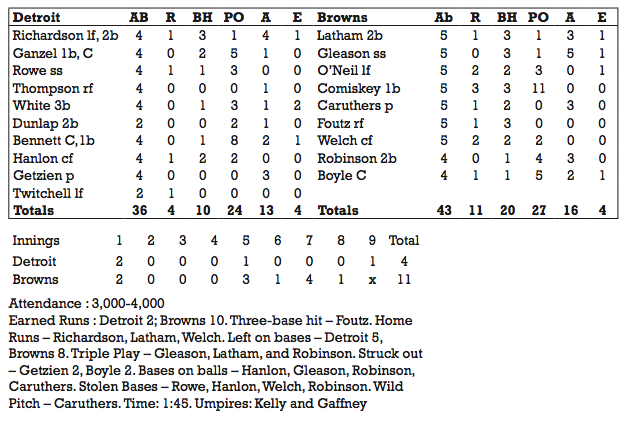 Curt Welch led the Browns with a three-run home run, while Latham, Gleason, Comiskey, and Foutz each contributed three hits, one of Latham’s also being a home run. The series stood at seven games to three. Immediately after the game, the players of both teams boarded a train to Baltimore to play the afternoon game. 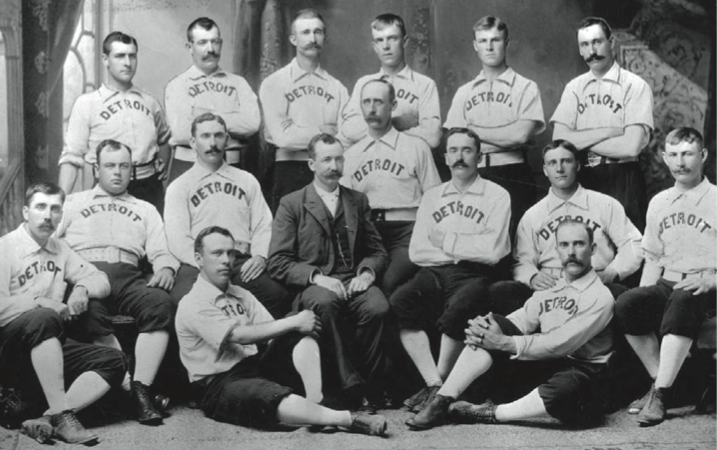 Detroit won 13–3 and clinched the city’s first world championship. It was a title delayed by a few hours thanks in part to the first triple play in post-season history, one that came off the bat of a future Hall of Famer.